How does one become obsessed enough with Halloween to dedicate months of time, hundreds of dollars and the better part of their home to the transformation? It all started with our family and friends. We love Halloween. They love Halloween. We’ve always wanted to create an elaborate yard display … so have they. And faster than you can say “trick or treat” the plan is hatched. Next thing you know, they’re spending every available minute at your house, transforming the garage, driveway, front yard and house into a realistic graveyard. From this initial haunt, the 1031 Club was born. When we purchased the house we live in today. From the moment we laid eyes on the yard, we knew its destiny was that of the ultimate Halloween cemetery. It took several years to bring the dead and dying to life, but the dream has become a reality. For over 10 years, we have created a creepy crawly yard haunt that has attracted people from all over the Portland area. It has become a spectacle of spectres that we are all quite proud of. But none of this would have happened had it not been for our good friends and family members who started us down this path, as well as the inspiration from fellow yard haunters throughout the country. From our family of freaks, fiends and the gratefully undead to yours, happy haunting. Feel a chill as you’re walking through the graveyard? Think you saw a shadow creep across the crypt as you drew near? Could be your mind playing tricks… or it could be one of our special ghosts lending a helping hand as you take this spirited journey. 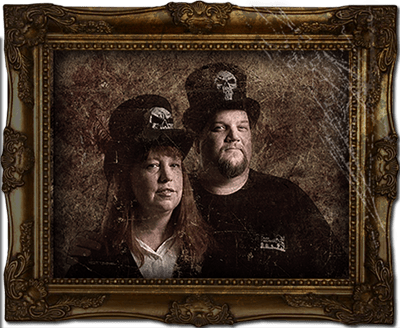 Here’s our rogue’s gallery of who’s haunting who. Our fearless leader, artistic director, and taskmaster, as well as mistress of the web (electronic, not spider). The original cheerleader for haunting the yard (sorry, the undead don’t carry pom-poms). Started the first-yard haunt in 1997. When she’s not busy making monsters, she collects frogs … and passers-by. Technical wizard. Online shopper. Resident builder of props. Takes care of anything that moves, needs to be built or goes bump in the night. Lighting director extraordinaire. Part of the original 1031 Club. Loves old Universal and Hammer monster movies, can you tell? Was a builder of monsters. Carver of foam. Shaper of all things evil and twisted. A kindred spirit with too much free time and the inability to say no. Crazy for crypts, a penchant for props, and a detail master when it comes to demons and such. Was a big gaming fan and book reader the rest of the year. He will always be with us in spirit. For some people, its duct tape. For others, it’s crazy glue. But for Daniel Dan Sharp, the simplest way to piece together all of life’s problems is rare-earth magnets. Dan is also an expert foam carver, or, as we like to say, if it can be printed on foam, he can carve it out. He keeps the cables and connectors neat and tidy on all the electronic equipment, too. Other tricks of the trade include LED red-eye specialist and giant spider creator. What does a therapist do in their spare time? Model for ghosts and make a mess with monster mud, of course. Meet Elys’ Thelin. Wife (to Daniel). Mom (to mini-minions Gabe and Max). And resident artiste, with an artistic style that’s, shall we say, right at home here in the Graveyard. Minion extraordinaire! There is no job to difficult or too small. From painting to foam texturing and everything in between, Dawn can do it all and then some. She can be found at all the Graveyard events lending a hand and shows up almost every weekend during the build season ready to tackle whatever needs to get done. Wife (to “Toph”). Mom (to mini-minion Alexis). She brings her own brand of humor to the graveyard that we all enjoy throughout the season. If it needs to be shaped or fabricated out of foam Matt is your man. If it is a tedious task that takes a lot of attention to detail Matt is on it. Matt brings to the team a unique brand of humor that we all enjoy and sometimes wonder about. Matt is our resident board and card gamer and he brings us new games to try out on the patio all the time. Stone texturing is what Lisa lives for. She’s always willing to help with painting or just cleaning up for an event. Wife (to “Matt”). She has a special understanding of Matt’s unique brand of humor that no other crew member possesses. When she is not helping at the graveyard she is tending her own garden and taking care of all her animals. Aimee is a Jacqueline of all trades. Ready to help out with any task at the graveyard. Also on hand to provide some quick comic relief or pop culture reference when needed. When not at the graveyard, she is working hard to provide a comfy life for their 4 cats. When not at graveyard Jason is in his library or writing spooky stories. Jason gets lost in projects and loses all track of time. Bones are his playthings and anatomy is something to be reworked, and improved upon. He loves to travel and is bored easily. Lots of cats hang out on the windowsill or at the foot of the bed. But when you find a stray cat who prefers hanging around the graveyard, you know you’ve found your kitty soul mate. Owners Chris and Jeff believe they found Hal, but Hal knows better. When the Davis were out working on crisp fall evenings, Hal curled up by the fire and supervised. He helped paint during busy season and took an occasional nap on the props. He even taught them his patented cat-scratch-fever technique to help age the tombstones. In short, Hal the Halloween cat played these two denizens of the dark like a fiddle and reeled them in like a twenty-pound tuna. Hal was the official welcoming committee and graveyard overseer. After 13years of haunting the graveyard, Hal is no longer with us. He will be missed. Jason King, Nick Brandt, John and Amy Gibson, Bryan Dorr, Marci Lehman, Preston Bishop, Josh and Gary Jensen, Milwaukie High School Dance Team, City of Milwaukie Police Department, City of Milwaukie, Roman Moreno, Karen & Keith Johnson, Andy Westerman, and Levi Black. And a special thanks to everyone that lent us their support, their enthusiasm, their time … and their spouse and/or mom and dad. Lex Reid * Max & Gabe Sharp * Kane Reynolds * Beckie King * Macy Bishop.